After signing for a Payoneer account, now it’s time to activate it. In this post, I’ll show you how to do that. When you get the MasterCard, it’s not activated yet. The delivery pack contains an activation code which you’ll need to use to activate your card. Visiting your account will allow you to find out the activation box through which you could activate your account. So, pick the activation code comes with the MasterCard delivery package and use that to activate your Payoneer account. I did the same things to activate my one. This is the part which will show you how to log into your Payoneer account. From the “My Account”, you can do so by using your username (the given email address) and the password. 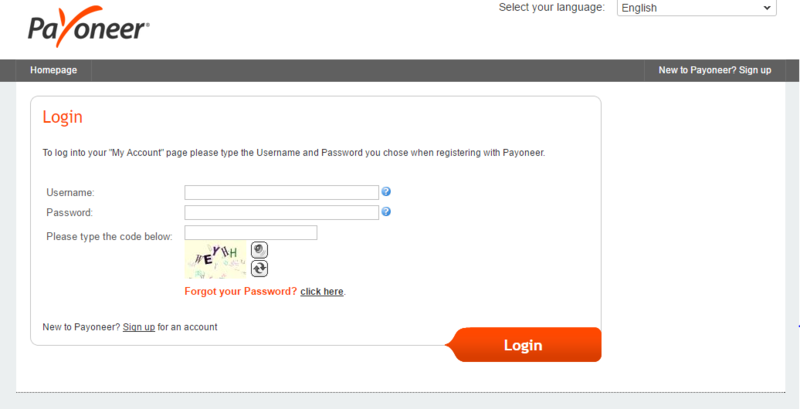 So, put your username and password to log into your Payoneer account. You can see that there are different document submission options such as National ID, Driver’s license or Passport. The time of submitting any of the mentioned documents is very short as per the email states – within only 5 business days. So, don’t do any delay in sending the required document as you may forget to do so on time. Hurry up and scan any of the docs and send that to the specified email. Again, you’ll have to wait for the account approval. You’ll get an email stating that your account has been successfully verified. Once you’re with a verified Payoneer account, now is the time to deposit it with some fund before you can really use it.